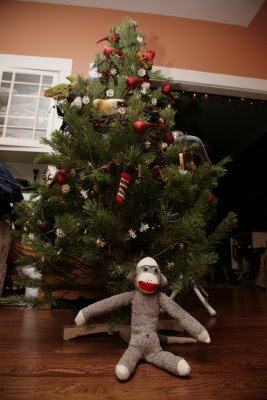 Here is my first vintage-style sock monkey, made from a pair of red heeled socks! He's rather homely, but I am quite fond of him and his thick unibrow. That's our Christmas tree. I covered it with various bird ornaments and berry and pine cone garlands. I wanted it to look like a bunch of colorful tropical birds were flying over Oakland, minding their own business, then saw my Christmas tree, and decided to perch on it and and gnaw on berries. You know, just like it would happen in nature. There are no presents underneath because there is only so much temptation our dogs can resist. The feathery ornaments are more than enough. Note the lack of ornaments on the lower sixth of the tree. But don't be fooled. 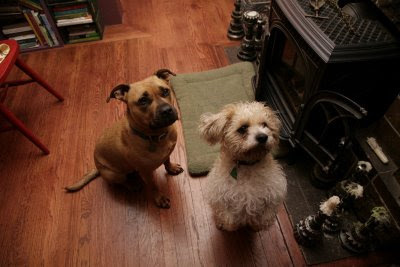 These are a couple of very bad dogs. We had family over on Sunday, and they took advantage of the ensuing chaos to escape and run at top speed across busy 14th Avenue in traffic. Needless to say, they were safely retrieved and returned (tails wagging and tongues lolling happily) to the house, but not before I burst into tears. Baaaaaaadddd dooooogggs! I've been knitting up a storm lately, so stay tuned for knitting posts. I love your sock monkey.